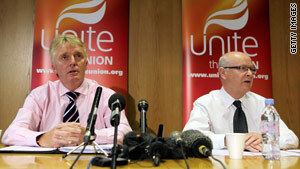 Brian Boyd, left, and Brendan Gold, the Unite union's officers. Gold said details of the deal will be released Tuesday. Operator BAA calls the deal "a fair reward"
London, England (CNN) -- The immediate threat of strikes at Britain's main airports was averted late Monday after a preliminary settlement was reached by British airport operator BAA and the union that represents the operator's employees, according to airport and union officials. The two sides have been locked in a dispute over pay and the Unite union voted Thursday to strike. A seven-day notice is required before a strike can begin. Six major British airports, including London's Heathrow, were in danger of being shut down amid the possible strikes. "We are very pleased to be able to reassure the traveling public that we for our side have worked tirelessly to achieve a settlement," said Brendan Gold, the national secretary for the BAA's union, Unite. Details of the agreement are expected to be released Tuesday, Gold said. "We believe that the unions are going to recommend acceptance of our offer to their membership, and if that's the case, then we are very, very confident that any disruption to our airport operations has now been avoided," said Terry Morgan of BAA after the talks. Morgan called the deal "a fair reward for our staff, but it's also a deal that the company can afford." Gold said the settlement will be presented to Unite's members by ballot in a vote expected to last about three weeks. The union also has an ongoing pay dispute with British Airways that started in May. CNN's Ayesha Durgahee contributed to this report.